The reefs surrounding Arrecife Alacranes provide habitat for many sea animals that are important in the human diet. This is also a marvelous, nearly untouched, tourist area. Enter Semarnat and Profepa, along with studies of tolerance estimation and tourist carrying capacity – and they don’t care how much money there is to be made. What they care about is sustainability and that the State of Yucatan and her people are not damaged in any way. For instance, they have both cargo and visitor limitations for every day. Once the permitted amount of cargo is unloaded, that’s it. No more. They will allow 111 visitors per day, and don’t think you can sneak in one or two extra. This is Profepa we are talking about. They are very nice, but they don’t play. What they have been watching is the gradual, then explosive, rate of tourism in the area of the islands. From 2003 to 2007, less than 3,000 tourists per year did a little damage, but not much – just the occasional collision with a coral reef or taking a bit as a souvenir. Then, tourist numbers went to more than 4,300 in 2008, and more than 4,600 in 2009. All of a sudden, tourist numbers shot up to over 9,000 per year, most without permission. The next boat to arrive belonged to Profepa. Now, one must have a bracelet granting them permission to visit the islands and cannot dock on the beach. The only activities approved there are sport fishing, snorkeling, sailing with a kayak or diving, but not spear fishing. If you want to go to the Alacranes, please get in touch with the authorities or a reputable fishing charter company to get the proper permissions. By Fall, there will be both federal and private companies that will issue not only permissions, but bracelets as well. No permission or bracelet means big trouble if you are caught in the Arrecife Alacranes. Isabella Springnuhl is a native of Guatemala and was happily following in her clothing designer grandfather’s footsteps until she finished her baccalaureate and applied for the next upper level of education. She was shocked to learn that she had been rejected because she has Down Syndrome. She was 20 years old and this was the first time anyone had ever made her condition an obstacle to anything she wanted to do. Obviously, Isabella Springnuhl is not someone who allows any obstacle to stand. She opened her own design company, branding her clothes as “Xjabelle,” exhibited them at London’s International Fashion Showcase in 2016, and was chosen by the BBC as one of the 100 most inspiring and influential women in the world, only nine of which are Latinas. Her clothing line is especially geared to people with Down Syndrome so that they can experience glamour and fashion in the same way that other people do. She has a boutique and also sells her clothing online and through different social networks. Heads-up expats who know and are possibly working with Yucatecos who own micro, small and medium sized businesses in Yucatan and who would like to export their merchandise to the United States: there is a new program called the Consolidated Progreso-Houston Container Project. Participating companies will have access to a simplified tariff for containerized cargo handling and services in the Port of Progreso and fixed, flat tariffs for customs clearance for businesses that export from one to three pallets. They also get 60 days of no cost storage in a warehouse in Houston and promotion of their products on the open market in the United States. In order to take advantage of this program, which begins shipping on March 21, 2017, the business will have to (1) Be enrolled in the Federal Register of Taxpayers, (2) Have the corresponding Digital Tax Receipts (CFDI), and (3) Contact the Customs Agent to be removed from the Sefoe directory. Booking must be four days in advance and cargo must be in the port’s cargo area at least two days before shipping. While the port will take deliveries every work day, actually shipping will soon be scheduled for Tuesdays only. This is wonderful news for both small businesses in Yucatan and for consumers in the United States. Congratulations to you both. Once upon a time, many years ago, as the children of Yucatan’s farmers began flocking to the city to attend universities, the lament went far and wide: “Their culture will be destroyed! They will never go home!” In the first place, some of them did not need to go home because their destiny was to become highly successful doctors, lawyers, teachers and business people. The rest needed a handy little degree known as Agricultural Engineering and membership in the Yucatan Delegation of the Association of Agronomists of Mexico, AC. …and then they went home… and, today, the headlines read that Yucatan’s agricultural sector is growing at twice the national average. Congratulations go to the Governor of Yucatan, to UADY, to all participating agronomists in Yucatan, and to the new leadership of the 2017 Yucatan Delegation of the Association of Agronomists of Mexico, AC. Needless to say, everyone is very proud of you all. Fifteen years ago, a few farmers in the Southern Cone of Yucatan began growing watermelons. They did pretty well here, so they increased their crop size a little every year, as well as learning a little more about growing different varieties of watermelons. …and then the magic happened. Yucatan’s watermelon growers hit their stride and it seemed as if watermelons were falling from the sky! There were so many watermelons in Yucatan that they drove prices down in neighboring states and some of Yucatan’s watermelon farmers actually apologized, in the newspaper, to the growers in other states. Yucatan grows watermelons on 232 hectares of land, with an annual yield of 10,000 tons of watermelon. They grow both seeded and unseeded watermelons, since you can’t have unseeded without seeded nearby anyway, and export 90% to McAllen, Texas. So, for those of you Snowbirds who are driving home, you might want to stop at the border and pick up one last reminder of Yucatan before heading north. Is it that time already? 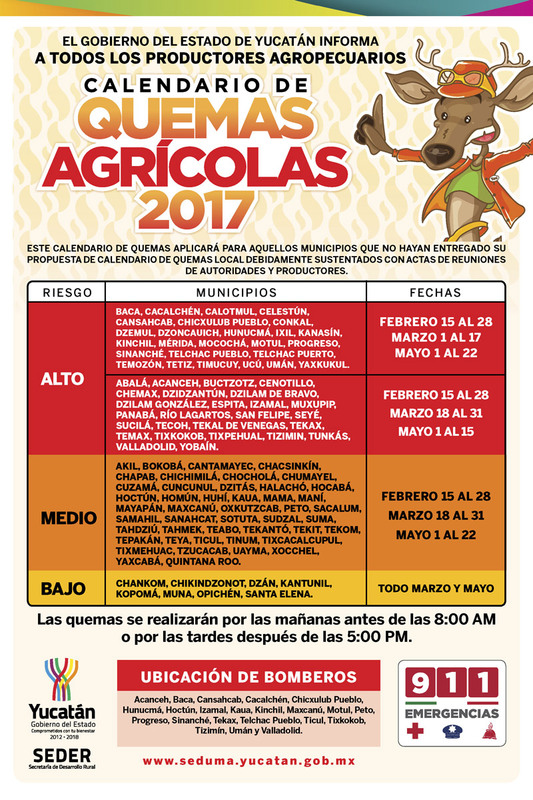 This is a link to the 2017 Agricultural Burn Calendar. From there, you can enlarge the image to make sure you can see all of the dates there might be agricultural burns either in areas where you live or in areas where you might plan to travel. Please be careful. Do not drive into smoke but, if caught in smoke, turn on your headlights so that others can see you. Also, summer will soon be upon us, so be very careful not to throw anything shiny out of your car. The sun can start a fire with almost any form of shiny trash. Many thanks to the religious group Family Life and their group leader, Paul Roop. They belong to a religious group called Family Life, which is based in Little Rock, Arkansas. The group donated 50 food pantries and $1,000 pesos to 50 families. The families who received the donations were on hand to thank the tourists who had arrived aboard a cruise ship. Let the NAFTA Games Begin! In order to force Mexico to pay for his wall, Trump believes he can put a 35% tax on Mexican exports into the United States. He does not seem to understand that such a tariff would force American taxpayers to pay for the wall twice – once to build it and a second time in the form of higher prices on goods imported from Mexico. Now, he is angry and wants to pull the U.S. out of the NAFTA treaty. That should raise prices on both sides of the border and make Mexico sorry they told him they won’t pay for the wall. Mexico will never be able to afford the goods they import from the U.S. Now, he’s shot himself in the foot again. Mexico consumes almost 30% of the corn grown in the U.S., some 13 million tons per year. They don’t have to buy from the U.S. because Brazil and Argentina would be happy to have their business. The U.S. agricultural economy would completely collapse with the loss of what now amounts to $2.4 billion dollars of corn sold to Mexico each year. More than 130 food companies, including Cargill and Tyson Foods have banded together to try to make Trump understand what a disaster his plans to play games of “get-you-back” with Mexico are really going to be. La Mama, a 24 year old giraffe, has died of an intestinal blockage, complicated by her fifth pregnancy. She did everything she could to assist her caretakers and veterinarians with her care but, in the end, her heart simply gave out. In the wild, giraffes only live to the age of about 25, so a pregnant 24 year old with an intestinal blockage must have been quite a shock to her veterinarians. If you visit Animaya any time soon and see a black bow near the giraffes, please do tell the workers in the area that you are so sorry for their loss. La Mama was loved by everyone who worked at Animaya and they are all brokenhearted over her death. I'm interested in diving or at least snorkeling at Arrecife Alacranes. But I'm new to the area. Could you be specific about whom to contact for permission and for boat transportation to visit the reef? Also, where do I find the authorities and the boat charters? I haven't seen or heard of a dive shop on the Gulf side of the peninsula.